Connect Logistics Services offers full service ordering and distribution services to Alberta Liquor Retailers. Our state of the art systems allow for rapid and accurate order fulfillment. To order liquor from Connect Logistics Services, buyers must be licensed by the Alberta Gaming & Liquor Commission (AGLC) to buy liquor products for resale in Alberta. There is a minimum order requirement of 25 cases per order. To provide consistently rapid order processing, Connect Logistics Services uses an order scheduling system. Buyers have designated days for ordering and receiving product based on their location within Alberta and their volume of products ordered. Buyers do not need to order regularly, as long as they work within the designated ordering and shipping schedules. Upon receiving an order, Connect Logistics Services will process the order, then pick, pack, and ship the product. Product is stored so that the fast-moving products are the easiest to retrieve. During order picking and packing, all cases are barcoded and radio frequency (RF) scanned to reduce any errors. Having indoor truck loading bays helps to facilitate rapid shipping. 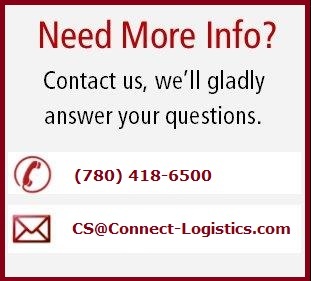 Connect Logistics Services operates a Customer Service Department to help Licensed Buyers with ordering and other issues. In our latest Customer Satisfaction Survey, the Customer Service Department received extremely satisfied ratings. We pride ourselves in solving Retailer's concerns quickly and answering questions meticulously.